It’s been just under a year since Yammer, the ‘Twitter for businesses’, launched at TechCrunch 50 and won the conference’s top prize. Since then the service has seen steady growth, with over 40,000 networks signed up for the service. It’s also become an absolutely essential tool inside the TechCrunch office, which is why I grew alarmed when I noticed that the service is currently down. But a quick visit to the site’s blog reveals that this was planned downtime, and for good reason: when Yammer comes back up, it will feature a host of impressive features in what may be the service’s biggest update since launch. We got in touch with CEO David Sacks, who outlined what we can expect when the service comes back later tonight. Revamped iPhone App — The big new feature here is Push notifications, which will allow you to get updated whenever you get a message without having to burn through SMS messages. The app also integrates a camera mode for taking photos, improved text entry (you can auto-save drafts and type in landscape mode), and improved performance. The app is currently pending approval in the app store, so we may have to wait a few more days to download it. 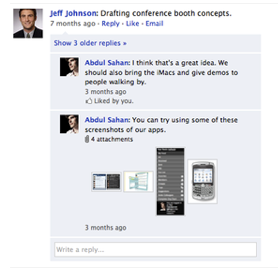 Likes — Yammer is adopting the feature popularized by Friendfeed and later “borrowed” by Facebook. However, Likes in Yammer aren’t just virtual pats on the back — every time you Like something, it will be shared with everyone in your network, which means that Liked messages grow virally. Threads — You’ll now be able to view messages in a threaded view, in a manner that looks very similar to Facebook, or you can revert back to the Twitter-like stream Yammer has used until now. The stream works fine for small groups, but it can become unwieldly when multiple conversations are going on at once, which makes the threaded view a welcome addition. For now this will be limited to the web version, but the desktop client will support it in the next few weeks. Improved Search — Search has been improved to include a number of advanced options, including limiting searches to a specific user or to coworkers in a certain group. Other improvements include more security options (you can make passwords automatically expire after a certain time period), a ‘broadcast’ mode for network admins that lets them send a message throughout an entire network, and an improved interface. All in all this is a great update for Yammer, which continues to improve on an already-solid product. Last month Yammer unveiled a rebuilt client for Adobe AIR, which was also a big improvement over the old app. 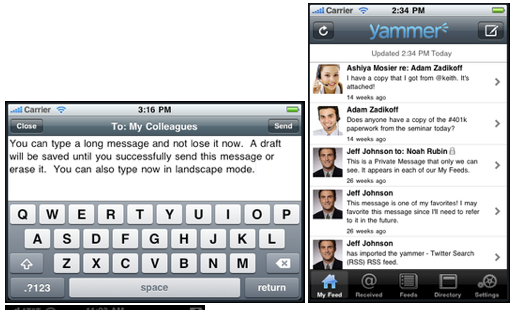 That said, I could do without AIR’s quirks — I wish Yammer offered some native clients.